Ice Hotel Roundup: Who wants to be a human popsicle? A night at an ice hotel conjures up visions of The "I Love Lucy" episode where Lucy Ricardo emerges from a meat locker with daggerlike icicles dangling from her nose, eyelashes, hair, and chin. Who wants to be a human popsicle? Apparently, tens of thousands do. An ice hotel is literally that- an igloo condo resort with everything from vodka bars to wedding chapels, entirely made of the hard cold stuff. Rumor has it that there may be as many as 14, these are the five most popular, well known, and accessible: the Aurora Ice Museum, Fairbanks, Alaska; the original Ice Hotel, Sweden; the Ice Hotel, Quebec, Canada; the Hotel Igloo Village, Greenland, and the Mammut Snow Hotel, Lapland, Finland. All offer day tours for the the curious and all except the Greenland facility offer a wedding option in an ice cathedral. Unlike traditional digs, the icebox dwellings are temporary. Crafted with thousands of tons of snow and ice by expert ice sculptors, the structures are erected mid December and last until April, except for Fairbanks that’s year round. And since each abode is custom carved, no two rooms look alike. Room temperatures are maintained at a constant 28 degrees Fahrenheit. Consider this cool experience something you could put on your resume next time you audition for Survivor . Says Agneta Ekebramd, of Canada, "I didn’t make it through the whole night, not because I was cold, but because I just was too excited being there," says tour operator Ekebramd of Scantours Inc., who sells packages to the Sweden establishment. Many of these hotels offer a backup lodge for wimps who simply can’t brave the conditions. After all, you are sleeping on a slab of ice, albeit pretty ice. At the Fairbanks Aurora Ice Museum, located on the premises of Chena Hot Springs Resort, guests slumber on an ice bed crowned with a caribou hide.Apparently, the world’s newest ice hotel as of 2004 is the the only one of its kind in the United States. Not officially called an ice hotel, the Aurora Ice Museum features unique ice statuary such as life-sized joustors on horses, a chess board, chandelliers that change hues thanks to colorful rotating lighting. The four guest rooms, sleep a total of eight people, and runs $575 when patrons lease the entire facility for the night. And here’s the good news: guests can book the rooms throughout the year, as the owner and master ice sculptor, Steve Brice, has figured out a scientific method that prevents the structure from melting. Like all the other ice lodges, Aurora personnel give guests mummy sleeping bags and give them a quick briefing before they retire for the evening. Don’t layer too much, they say, or your sweat will become cold and chill you to the bone. And, it’s best to relieve yourself before sleeping because that extra body heat should be reserved to keeping your flesh as warm as possible. Besides, who wants to jump out of his sleeping bag when its 28 degrees outside to go potty? If you get too cold, you can also take a drip in the natural hot springs just fifty feet away. Consider coming during the World Champion Winter Ice Art Championships taking places on Feb. 28 to March 26. The globes’ top ice sculptors converge for an artistic duel to the finish. Visitors can also have an opportunity to witness the Northern Lights phenomena during this season. Cool factor: Guests can sign up for a 3-day ice sculpting glass for $1,800. Contact info: Chena Hot Springs Resort, P.O.Box 58740, Chena Hot Springs Rd., Fairbanks. Log onto www.chenahotsprings.com or email the folks at Chenahs@polarnet.com . Calling is also fine at 1/800-478-4681. So you want to get married, eh? Unconventional couples can exchange warm vows at the fairytale-like Ice Chapel with 18-foot cathedral ceilings here at the Ice Hotel, now in its sixth season of operation. Based 30 minutes away from the center of Quebec, the 30,000-square foot frozen icon could remind Baby Boomers of the Ice Fortress on the planet Krypton in the original Superman movie with Christopher Reeve. 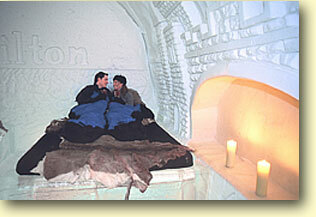 Ice Hotel Quebec boasts 34 rooms and suites, several of which have decorative fireplaces. Intrepid families are also welcome to tough it out in an igloo suite with ice beds topped with reindeer skins. All the rooms are so popular that sales have gone up 52 percent compared to last year, say Ice Hotel executives. This monolith is nothing less than a feast for the eyes. Over 36 different ice sculptors have chiseled works of angels, penguins, sleighs, and horses to adorn the exterior and interior. The courageous can take a dip in one of the outdoor hot tubs, chill at the N’Ice Club lounge, or go for drinks at the Absolut Ice Bar where bartenders serve vodka in glasses made of (what else?) ice. Rates start at approximately $180 per person per night. The season ends on April 2, 2006. Cool factor: Daytime guided tours are available for $14 per adult, $12 for students, and kids 6-12 years old. Lots of optional excusions are available such as ice fishing, dog sledding, shoe showing, and snowmobiling. Contact info: Ice Hotel Quebec-Canada, 143 Route Duchesney Pavillion L’Aigle, Saint-Caltherine-de-la-Jacqures Cartier1/877-505-0423. Look up www.icehotel-canada.com . The Ice Hotel in Jukkasjarvi, Sweden takes pride as being the first one in the world which opened in 1990. Created from scratch each and every year, the establishment covers over 30,000 square feet, and can accommodate over 100 lodgers in 60 rooms and suites. Depending on the clarity of the evening, guests may be able to see the Northern Lights, otherwise known as the Aurora Borealis, an unusual rainbow shower in the sky which occurs annually. The hotel includes an Ice Chapel for weddings and baby christenings, art exhibition hall, cinema, and the world famous Absolute ice Bar with counters and barstools and lounging alcoves and tables carved from ice. Rooms run about $400 per night. The season concludes on April 15. Cool Factor: Guests can request an airport transfer from Stockholm via dog sled. For approximately $1,000 per sled, a maxmium of four guests can enjoy a 90-minute romp through the woods and door-to-door delivery service with a musher and pairs of huskies. Contact info: Ice Hotel Sweden at www.icehotel.com ; or call Scantours 1-800-223-7226. See www.scantours.com . The town of Kangerlussuaq, Greenland is the home of the Kangerlussuaq Hotel and Conference Centre, and in the winter, the home of the Hotel Igloo village. Operational until the beginning of April, the hotel consists of six illuminated igloos. Dead animal fur of choice here is the musk ox. With rates of only $80 per night, the igloo is surrounded by ice sculptures hand carved by its own Greenlandic artist Jens Abrahamsen. Cool factor: the optional excursions include riding an Icelandic pony. Contact info: Hotel Kangerlussuaq 299-84-1190; www/greenland-guide.dk/igloo; email kangbook@glv.gl . Resort facilities like the other ice hotels are all the rage at the Mammut Snow Hotel in Lapland, Finland. This one, however, is found on the premises of the Lumilinna Ice Castle, a full-blown castle made of ice filled with ice scuptures and snow play areas galore. With 29 rooms that sleep two people each and two family suites that sleep five, the Snow Hotel also features an on-site restaurant serving hot and cold food. Can’t you just taste that Baltic herring soup now? Rates: $150 for single occupancy; $132 for double occupancy. Cool factor: The hotel is very kid-friendly. A family snow play area comes with its own signature snowball characters, Arttu and Genie, who roam around this Disney-esque winter resort. Contact info: Mammut Snow Hotel, 358 (0) 16-259-502 or look up www.snowcastle.net . Email owners at info@snowcastle.net to book. *Dress in many, many layers. *Wear nylon, not cotton clothing. *Bring a pencil to record your journey; ink freezes. * www.snowcastle.net – Mammut Snow Hotel info. * www.icehotel-canada.com - Details and bookings for the one in Quebec. * www.chenahotspings.com - More on the Aurora Ice Museum. * www.greenland-guide.dk/igloo - Hotel Igloo Village in Greenland with cool pictures. Kathy Chin Leong just returned from her brrrisk visit to the Ice Hotel Quebec.